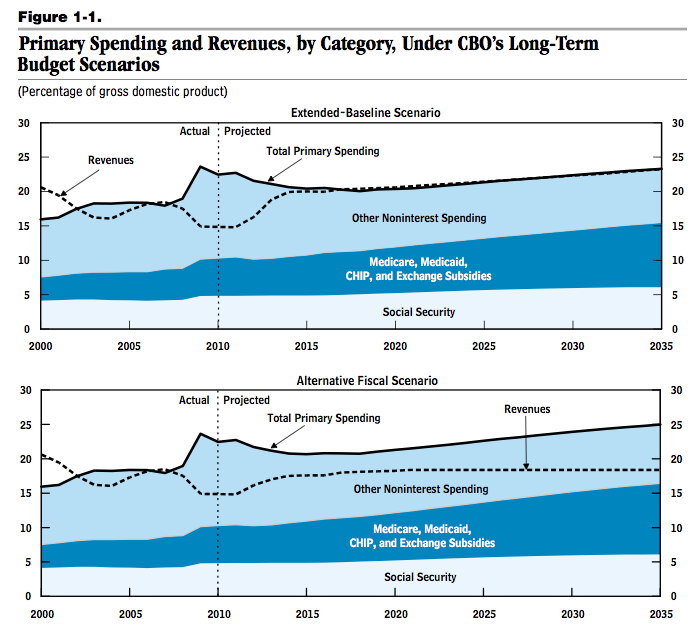 That’s the key chart from the Congressional Budget Office’s Long-Term Budget Outlook, published just last month, which I read from cover to cover. The CBO is generally considered the authoritative source of budget projections, and CBO “scoring” has been an important aspect of legislative debates over the past few years. Although politicians from both sides criticize the CBO when they don’t like its results, I think it’s fair to say that it is generally both respected and nonpartisan. Now, when people say that the federal government faces a long-term budget gap, they (including me) are generally starting from the bottom half of this picture: the CBO’s “alternative fiscal scenario.” The alternative scenario is widely considered the most likely path the budget will follow under current policy (although the CBO itself makes no such claim*). That’s probably a close enough approximation for most purposes. But if you’re going to think hard about long-term budgetary paths, you need to be a bit more careful about what it means. To start off with, you have to understand what the “extended baseline scenario” — the top half of that picture — means. That’s pretty simple: it means under current law. And the first thing you should notice is that, under current law, there is no long-term budget gap. From 2015 into the indefinite future, the government’s primary spending equals its revenues. The only spending not included in primary spending is interest on the debt. Since the debt stabilizes at about 75-80 percent of GDP, interest payments are only about 3-4 percent of GDP, which is barely above real economic growth; under these conditions, the debt will grow very slowly. The alternative fiscal scenario is the CBO’s response to this problem. The question is what assumptions should go into this scenario. As I said, virtually everyone agrees that the AMT and Medicare reimbursement rates will continue to get patched because Congress does it every year — AMT since 2001 or so, Medicare since 2003. Another obvious one is that spending on the Iraq and Afghanistan Wars will decline, saving over a trillion dollars over the next decade. (The rules governing the CBO’s baseline projections force it to assume that war-related spending grows with the inflation rate, regardless of conditions on the ground.) But after that, things get murkier. On the revenue side, the CBO’s alternative scenario assumes that all of the 2001, 2003, 2009, and 2010 tax cuts are made permanent, except for the two percentage point payroll tax cut passed in December 2010, at a cost of about $3.8 trillion (in addition to the AMT patch, assuming the AMT is patched). If I were to guess what would happen to tax policy, that would be my best guess, too, given politicians’ love for tax cuts. But this feels much more like a bet than a foregone conclusion. But then there’s an even bigger assumption: that total tax revenues will remain constant at 18.4 percent of GDP beginning in 2021. See the flat line in revenues in the bottom half of the picture above? That’s due to that one assumption. Now, it’s not a crazy assumption. There are some people saying that revenues can’t exceed 18-19 percent of GDP for long, and that’s clearly wrong: if there were some magical limit to taxation, it would have to apply at the total level, not just the federal level; and in any case, it clearly doesn’t apply in other economies similar to ours. But it’s plausible to argue that, for political reasons, tax revenues are likely to wobble around 18-19 percent, which is the long-term average, after all. That is, if one party manages to push tax revenues above 20 percent, the other will get voted in and cut taxes down below 18 percent. In fact, this is exactly what happened a decade ago: the Bush I tax increase, the Clinton tax increase, and the 1990s boom pushed revenues above 20 percent, and then Bush II came in and (helped by a recession) cut taxes down to the mid-teens, where they are now. But what feels slippery about both of these assumptions — full extension of the recent tax cuts and fixed revenues as a percentage of GDP thereafter — is that they basically assume that the Republicans win on tax policy. (Note that the one tax cut that is not extended — the reduction in the payroll tax — is the one that Democrats pushed for last year.) Hold that thought. So on both sides, taxes and spending, I can see where the CBO is coming from. But the result is that the definitive report on our long-term budget gap implicitly assumes that we do nothing about that budget gap — that we keep cutting taxes and blocking spending cuts at every opportunity. At the same time, we know this is not going to happen. The alternative scenario says that in 2035, the national debt will be 187 percent of GDP, the primary deficit will be 6.6 percent, and interest payments will be 8.9 percent, for a total deficit of 15.5 percent. We all know something will change before we get to that point: the question is what. The CBO is really in an impossible position, since it’s impossible to predict what will change. So I actually think they did the right thing: they painted a picture of where we are heading, assuming that we continue making the political choices we have been making for the past decade. In other words, they assumed that the kinds of choices we make will not change even as the overall fiscal environment does change. The resulting picture is pessimistic on both the revenue side and the outlay side, but that’s really because it’s a commentary — as neutral a commentary as possible — on our current political course. “The alternative fiscal scenario embodies several changes to current law that would continue certain tax and spending policies that people have grown accustomed to (because the policies are in place now or have been in place recently). . . . After 2021, the alternative fiscal scenario also incorporates modifications to several provisions of current law that might be difficult to sustain for a long period. . . . Together, the changes incorporated in this scenario represent one interpretation of what it would mean to continue today’s underlying fiscal policy” (p. 2). ** The AMT is an alternative income tax system that disallows a bunch of deductions and taxes all income at 26-28 percent. The parameters of the AMT are not indexed for inflation, so over time it should affect a growing percentage of the population. However, Congress periodically patches the AMT by raising its parameters temporarily. This is like indexing, except the patches are always temporary (because otherwise they would create a huge budgetary gap). *** Same basic idea as the AMT. The 28 percent figure is from the CBO’s Budget and Economic Outlook, January 2011, p. 62. **** This isn’t quite right, since both parties have become vocal defenders of entitlement spending (see the Republican behavior during the health care reform debate), but you know what I mean. This entry was posted in Commentary, Debt and tagged budget deficit, CBO, national debt. Bookmark the permalink. budgetary forecasts and politics 101. I guess the large amount of graphs make for quicker reading than thick text, but if you read all of that CBO Long-term budget, you definitely have more self-discipline and fortitude than me James. The alternative scenario says that in 2035, the national debt will be 187 percent of GDP, the primary deficit will be 6.6 percent, and interest payments will be 8.9 percent, for a total deficit of 15.5 percent. We all know something will change before we get to that point: the question is what. “We all know something will change?” I might take the other side of that bet. Often, the AMT patch is written about as if it is a “good” tax expenditure. Somehow, cutting taxes for the better off end of the middle class is a good thing, even when we are running large deficit. If the doctor patch is good policy – I don’t really know – then we need more money from someplace. Wars will end some day, and assuming we don’t get into others anytime soon, that will help. Add in expiration of the Bush tax cuts and allow the AMT to work and we’d have a tremendous push toward budget balance, without having to legislate a thing. Frankly, I’d love to have a 50%+ tax on income above $500k/year and a wealth tax, to boot. I doubt there’d be any serious economic harm. Problem is, that would take legislation, and that would require firing all the Democrats, along with all the Republicans, currently in Congress. So better to do things that don’t require doing things. Let the tax cuts expire. @kharris: Someone, I forget who (but it’s probably multiple people), pointed out that all we really need is an ironclad PAYGO rule, so that when Congress patches the AMT and enacts the doc fix they have to do something else to compensate. Unlike regular income tax, I don’t get a carry-forward credit into future year(s), which reduce my regular income tax liability, in the carry-forward year. The AMT has this credit feature, which is a refundable credit. So, while this parallel tax system called the AMT was designed to negate the effects of certain itemized deductions and tax preference items of certain taxpayers, it now represents a deferred tax benefit. Don’t even get involved in this debate. First of all, budget ‘projections’ are nonsense. There’s simply too many variables. It’s like trying to predict the weather — ten years down the line. Secondly, this isn’t a case of rational argument. It’s all political maneuvering. One minute Cheney says that the deficit doesn’t matter (one of his more lucid moments), the next the Republicans are pushing the US into default to curb spending. These debates are what they are. Rubbish. Point to Japan. Kill the argument. You’re far too intelligent to partake. Hi James: Pure fantasy: revenue aligning asymptotically with federal spending in 2015, and extending 20 years out. I have productive swampland to sell in south Florida, any takers? The answer to our collective folly resides not in patching the AMT, or pretending the “long war(s)” are going to cease, or restricting the elderly Medicare benefits, such as my 83 mom is receiving, and keeping her going. No, in the world according to Woop: tax the rich, especially by imposing a Tobin or sales tax on speculative Wall Street transX. There’s money there that would go a long distance in alleviating the “extended baseline scenario” overview, shown in the top chart. So far, the rational solution has “eluded” policy makers, and almost everyone posting on this board understand WHY. ooppss coffee lag: should be: the second graph….the one showing large space between revenue and expenditures. The top graph is the unrealistic heathy picture. James, great budget 101, and thanks for that. The problem is more than obvious. First, the CBO and you are both using thought and logic to come to conclusions that are meaningless, because, two, our leadership uses no thought or logic (as real leadership tools) to make decisions. We all know that they don’t make decisions. They either do what their handlers tell them to do, or follow party dogma. Either way, there is nothing rational in our governance. Even to a casual observer this is obvious. So, yes, trend predicting based upon traditional action is not so difficult. The worst case then becomes the most likely case every time. You see, they don’t actually care about what happens to the budget. They only care about what happens for them after office. The more they obey their handlers, the more likely it is that they will become much more well heeled after their days on the Hill or in the WH are over. End of story. I can easily come up with rational solutions to our “crisis” none of which will come to be. Sad, really sad. Clear long term budget forcasting is senseless when you have only a short term clock. @ Bayard, yours are among the MOST rational, practical, and reasonable solutions that I’ve seen anywhere, let alone all the NOISE coming out of that “swamp” with the fancy buildings, or on the “media” outlet talking heads = paid shills. The thing with the AMT is that it’s intensely complicated and doesn’t make intuitive sense as a calculation. With the regular tax, you can see that the reason you have to pay so much is that you made a lot of money (whether or not you feel like you actually make a lot of money; the IRS thinks you made a lot). With the AMT, it’s not clear why you have to pay it or not. This means that Congress has to avoid having lots of people have to pay it, because they’d be mad. But taxpayers in that 1/5 of the population generally wouldn’t be nearly so upset about a baseline rate change, even in the same quantity. In fact, if the rates went up, people would probably forget about it a week after it passed, and frown briefly at their paystubs when the withholding went up. I think it would be politically feasible to raise taxes by taking up the issue of the AMT fix for the year early, and holding out on doing it until a deal was struck where the AMT adjustment is automatic but the beneficiaries pay for it through the regular tax. The assumptions behind both scenarios appear to be Real GDP growth averaging around 3.5% from 2011 through 2017 and 2.4% thereafter. Seems optimistic. A third scenario could be considered as a real possibility – a “new normal” economic trajectory with lower than historical growth rates, for example 2%. The outlook might be scary enough help refocus the debate onto what needs to be done to re-engineer the US economic system back to a level of underlying healthiness, efficiency, and global competitiveness. 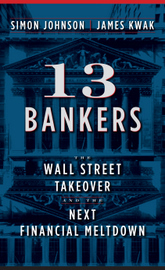 necessary for 2.5 to 3%+ annual GDP growth (that is not artificially fueled by by borrowing). Does real GDP include valuation of derivatives? If it does, then add GDP to another bogus statistical phantasmagoria. I realize that this comment is going up very late, but I have not been reading for a while. What I get from this is that the economic, if not the political reality, is that we need tax policies that average revenues of 20% of GDP instead of the 15-18% that we seem addicted to. The mania for tax cuts has always been under the belief that they will stimulate economic growth, but there is little historical evidence for that. Second, there is no mention of significant cuts in military spending. I realize this is a dicey issue since military spending works its way through the economy in all sorts of ways, but obviously Afghanistan and Iraq have contributed mightily to the current debt.